Dubai has edged closer to its goal of launching a pioneering hover-taxi service, with the authorities announcing a successful "concept" flight was made on Monday without passengers. 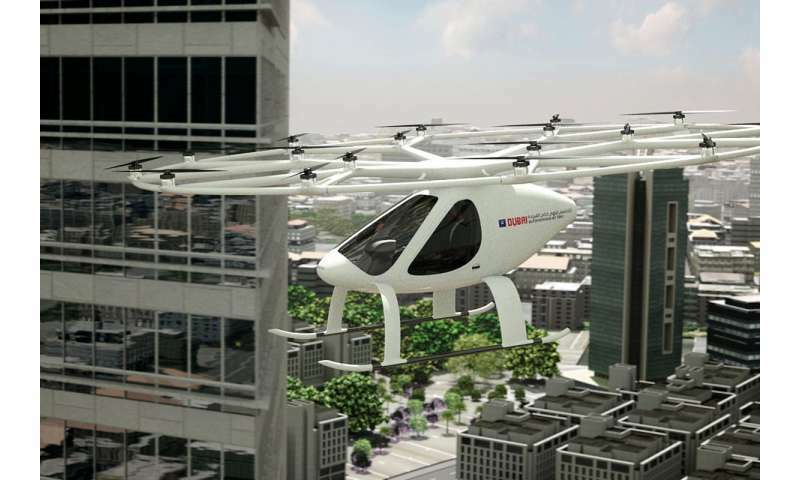 Safety features for the two-seater air taxi include emergency parachutes and nine independent battery systems, according to Dubai's Road and Transport Authority (RTA). It said the prototype, supplied by Germany-based Volocopter, can fly for 30 minutes at a maximum speed of 100 kilometres per hour (62mph). The RTA envisions that the hover-taxi will eventually be integrated into the city's existing public transport network, which includes a metro system, tramway and buses. Passengers would be able to book their "autonomous air taxi" and track its arrival and route using an app. Authorities anticipate five years of testing to put in place safety procedures and legislation governing the cutting-edge mode of transportation. Home to Burj Khalifa, currently the world's tallest tower, Dubai is a leading tourist destination in the Gulf, attracting a record 14.9 million visitors last year. How long to charge for 30 minutes of flight time? Considering the taxi has to fly from a depot to pick someone up, then fly to a destination, then back to the depot, I can see this machine as a 1 flight wonder until it recharges. Sounds expensive. Charge time could be quick, less than 30 minutes. At 250k it isn't cheap but looking at used helicopters it's vastly cheaper. It's more expensive than a ground based taxi (though the average taxi in Dubai is a big Mercedes, which would put it in the 100k range, so not *that* far off). In any case, the modes of transport (car/helicopter/volocopter) aren't really comparable because they serve different use cases. i wonder if Ehang has been kicked out of testing in dubai completely? There was all this news in july that Ehang is going to be their Taxi, then all of a sudden it went quiet and Volocopter made the headlines, and no Ehang anymore. Is that just how business work in dubai, changing their minds on a dime ? The volocopter is nice, but i liked the sleekness of the ehang. To have both operate there would be nice. Also a bit lower on the specs (40kg less carrying capacity, lower range, not mutiply redundant layout like the Volocopter and only one seat. Which means the Ehang is 'autonomy required' while the Volocopter can be piloted. Which might be important for getting air taxi traffic accepted by the public). In order for this project to be fail-safe, Dubai is going to have to do something about the unprecedented levels of EMI in that city. Absolutely off the charts. And the aircraft design will have to be both hardened from EMI, and accessible to necessary signals, since the GPS, compass, communications, telemetry, etc. will all depend upon lack of EMI to operate. You are aware that Dubai runs stuff like hospitals - which have ridiculously low EMI requirements. And yes: GPS does work in Dubai. Fully charged battery packs, strategically located throughout Dubi, will be needed, for this technology to be successful. I read somewhere there is an advanced system (researched by the military ?) That can be used on a drone without using gps (perhaps implement it as primary navigation if it's good enough and gps as redundency ? it uses complex algorithms, calculations to navigate in conjunction with VOR's ? aarghh... where's that article again. Or was that without VOR's ? Perhaps volocopter designers also fancy the fact that smaller rotors is less suspectible to wind disturbances, well at least we had a custom hex that we built with huge rotors and found that the big rotors causes the multi to be thrown around in windy conditions more so compared to using a multicopter with smaller rotors. Still like the look of using less rotors, and the sound of those monster blades :D They should improve on the concept and make it just as stable as a multi with more than 8 blades. i meant esc's not flight controller. I don't think aerodynamics play much of a role in any of these designs. Quadcopters can be flying bricks and not lose much in the way of efficiency. i'm sure deisgner-vehicles will come along to make these 'snazzy' once the tech is approved. Yes. What I get from their site is that they have 9 independent battery packs and 16 rotors...which pobably means 2 rotors and one battery are one unit (and one main/safety pack). So it's effectively an octocopter in terms of redundancy. You always want rotors to fail in pairs anyhow because of conservation of angular momentum. (Still means 3 pairs can fail before you have to deploy the emergency parachute...which would make me feel very safe about riding in one. and be willing to risk your life as an early-adopter (are you willing to do it? Sure. After the test phase they're doing right now.. The biggest 'danger' I can see in these would be faulty software - not in any of the hardware components. But if you've ever looked at the code required to keep a quadcopter stable it's really ridiculous how littel you need. So I wouldn't be worried about that, either. Why would you draw such a apples-to-dogdoo parallel? Because there's such a thing as doing EMI tests (active and passive). We do that stuff here in germany before we release products, you know? It's not like these guys will put this out in the wild without putting any kind of thought into it.